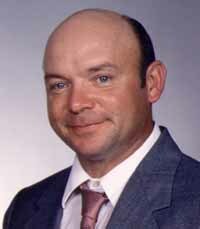 Ronald L. Jarrell, 51, of Breese died Thursday February 19, 2004 at St. Elizabeth hospital in Belleville. He was born February 27, 1952 in E. St. Louis to Carl and Caroline (Kult) Jarrell. His mother survives in O’Fallon, IL. His father preceded him in death and so did his father and mother in law Katheryn and Jon Orwig, DDS. He married Michelle Orwig March 16 1973 in O’Fallon Il and she survives in Breese. Ronald was a member of St. Augustine Catholic Church in Breese, work for the CSX Transportation Railroad as a signal maintainer. He also was a member of the Breese Knights of Columbus, and local chairman of St. Louis West District of the brotherhood of Railroad Signalman, Winton Local 94. Besides his wife and mother, Ronald is survived by a daughter Jennifer Jarrell of Shiloh and a son Brian Jarrell of Breese, a grandson Kyle Jarrell, 4 brothers and 4 sisters. The brothers surviving are Carl (Cheryl) Jarrell of New York, Garry (Lois) Jarrell of Marine, Bill (Karen) Jarrell of California and James (Corinna) Jarrell of Shiloh. The sisters surviving are Cindy (Steve) Karraker of Shiloh, Diane Jarrell of Belleville, Judy (Robert) Shannon and Kathy (Kenny) Hurst all of O’Fallon, IL. He is also survived by brothers in law Jon (Donna) Orwig of Flora, IL, Carl (Margie) Orwig of Troy; sisters in law Julienne Moreland of Marrow Bay California and Katheryn (husband-Richard Chiurazzi) Orwig of Elk Grove California: 19 nephews and nieces, 5 great nephews and nieces. Memorial services will be held Tuesday February 24, 2004 at 10 Am at St. Augustine Church, Breese with Father Chuck Tuttle officiating. Friends and relative may call from 9 to 9:45 am at the Church.